As the days and weeks go by, the list of boxing’s “cowards” gets longer and longer. In more recent years the lists continues to extend and includes grounded champions and potential Hall Of Fame fighters. It seems as though every time a fan friendly fight isn’t ‘signed & sealed’ the blame and allegations of ‘cowardice’ befalls on the MAN that has spent YEARS risking his health & life every time he steps into a ring. 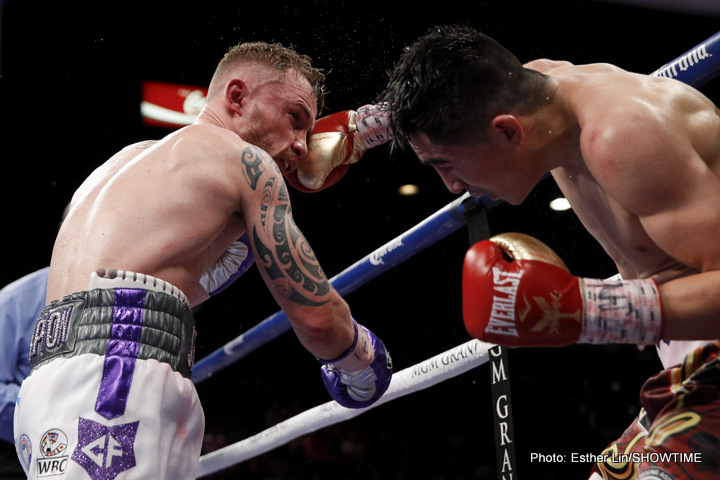 The names of Floyd Mayweather, Andre Ward, Miguel Cotto, Adonis Stevenson, Danny Garcia, Leo Santa Cruz and even Carl Froch have been labeled and deemed “cowards” with little regard of their ring accomplishments. And of course, add to the list Saul “Canelo” Alvarez and his promoter, Oscar de la Hoya. “Cowards’?? Fighters?? “Cowards’?? Do these “keyboard warriors” have the slightest notion what it takes to become a fighter, let alone a CHAMPION?? Most fighters, whether champion, contender, journeyman.. began taking their lickings as 10-12 year old ‘babies’ that fell in love with the game when they entered a gym for the very first time and were hypnotized by the sound of music of the speed bag. Others watched as they stood outside the neighborhood bars watching their Dads, grandfathers and uncles wildly cheering and rooting their idols. Youngsters who went to the gym faithfully accepting the bloody noses, busted lips and black eyes they were surely to receive as they sparred with the more advanced crop of fighters, used as ‘cannon fodder’ to get the the more skillful in fighting shape. It was part of the process, it’s the way is, no way around it. But the dream of progress, recognition and of one day having a bar full of boxing psychos cheering for him and having “The Belt” strapped around his waist drives him to the gym, day after day. He accepts the whippings, aches, pains along with the persistent tongue lashings of his “heartless & sadistic” trainer that secretly loves him like a son. The better he gets the HARDER he gets hit by others that have equally developed & progressed. Most “keyboard heroes” never take into consideration that many tragic “pugilistic dementia” endings begin in the gym, the endless sparring before the fights. Many of those very talented youngsters heads were still too tender or not yet ready to absorb the ill intended “bullets”, not all bodies are the same, heads included. For many the effects & hidden symptoms are later revealed. Sad. Most “keyboard tough guys” never lived with or even seen a suffering ex-pug that no longer even remembers that once hundreds of bars filled crazed fans cheered his name. Most of those TRUE WARRIORS, that laid it ALL on the line are cruelly ridiculed by the infamous “keyboard hotshots” once their careers begin to slide, don’t give a rat’s behind about them when the’curtain of life’ makes it’s final call. Back to are most recent examples of “cowards”, everyday that goes by, the once ‘sport’ of boxing becomes MORE of a business. Many fan friendly fights aren’t made because of RISKS are far too great, or presently considered a ‘bad business’ move. If Floyd and Manny had faced 7 years ago I wouldn’t have grossed ONE EIGHTH of what it eventually did. Only one of many examples. Should fighters try to to build a decent “egg nest” before risking it all after the years of sacrifice? Well, sometimes yes, depending on the offers made. Most of the time we don’t actually know what the financial terms are. Another factor, probably the most important, is that the fighter himself doesn’t call the shots or he allows himself to be guided by the promotional team that took him out of poverty. “COWARDS”?? Ward? Cotto? Froch? Santa Cruz? Floyd? and… Canelo?? Canelo that turned pro at age and faced experienced mature at the tender age of 15?? Don’t get me wrong, I want to see Canelo vs GGG just as bad as anyone else, but I understand that BUSINESS is BUSINESS, whether I like it or… not!! “Cowards”?? Well, certain fights are in fact avoided, but but actual cowardly fear has nothing to do with it. Sometimes the timing isn’t right or not an wise business move. If you think that fighters scare or become filled with fear that easy well… you don’t know the composition of the FIGHTER. Or.. ask that 10-12 year old boy on his way to the gym to take a licking, knowing darn well that he will be PROUDLY returning home with the MEDALS of a busted lip, blood nose and a possible black eye!